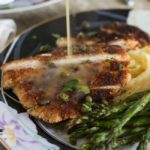 Flaky salmon filets and a pungent lemon sauce make eating healthy easy! 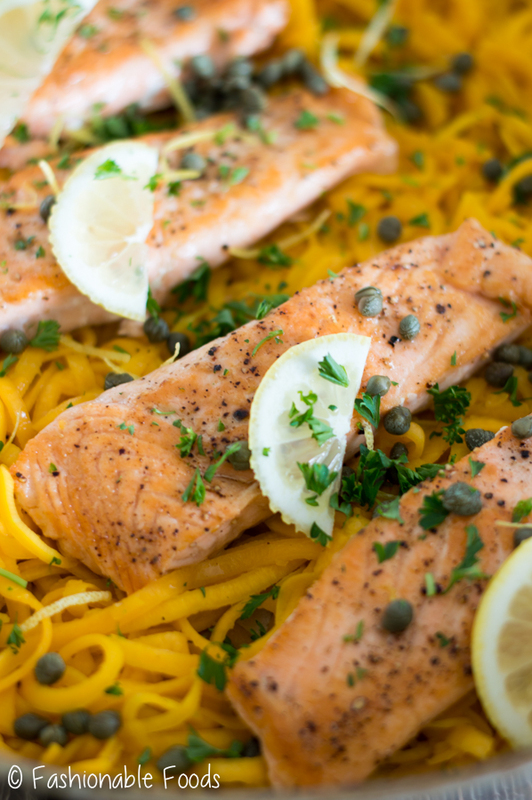 Salmon piccata with butternut squash fettuccine is simple to make and is gluten-free, dairy-free, Whole30, and Paleo! Happy Friday! The first week of the New Year is coming to end and I have to say, it seemed to drag on a bit. I’m saying that as a positive thing because 2016 flew by! 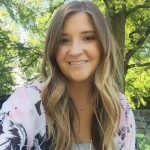 2016 was such an eventful year for me… my blog has grown enormously, we bought our first house, and we got married!!! ? I’m pretty sad to have said goodbye, but I’m really excited to see what 2017 holds! If you overindulged a bit during the holidays (??????) 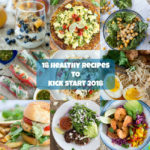 and are looking for some healthy recipes, I’ve got you covered! One of my goals for 2017 is to use my spiralizer more often and incorporate more veggies into my diet. So, I’m starting things off by doing just that! 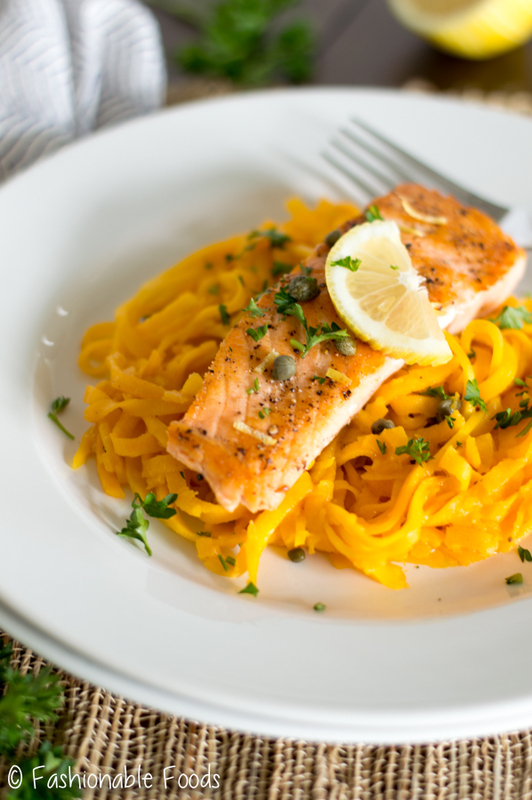 Salmon piccata over butternut squash fettuccine is full of healthy fats, protein, and a flavorful pungent sauce. Plus, it’s insanely tasty! 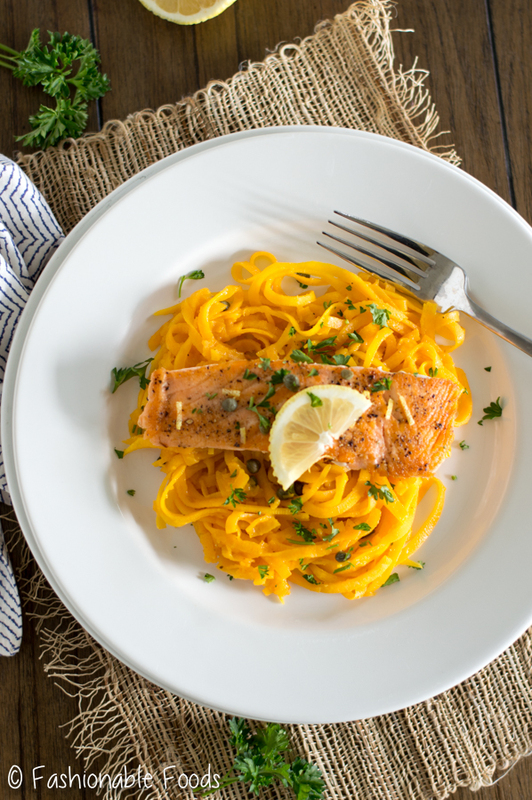 This recipe combines all of my favorite things: salmon, butternut squash, and LEMON. Plus, it’s insanely easy to make, comes together super fast, and uses only one pan. One pan cooking is always a win in my book! This salmon piccata is perfect for busy weeknights, or even meal prep, if that’s your thing. You can make it and then divide it up into containers for easy lunches during the week. As with most of my recipes, you can easily alter this one to suit your tastes. Not into butternut squash? Use your favorite spiralized veggies, or serve it over quinoa or rice. 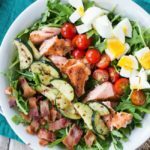 I think this would be fabulous over zucchini noodles, but I wanted to stick with an in-season vegetable. You can also use chicken if you prefer it over salmon. Oh, and this recipe is not only gluten-free, but dairy-free, Paleo, and Whole30! That means you can tackle your new year’s resolutions whether you’re just trying to eat healthy or doing a round of Whole30. I hope you all have a fabulous weekend and stay warm! It’s supposed to be quite chilly here and possibly even snow. I for one plan stay close to the fire with a hot cup of tea and Netflix! ?? Heat 1 teaspoon of the oil in a large nonstick skillet over high heat. Season the salmon filets with salt and pepper and add them to skillet. Cook the salmon for 3-5 minutes per side, or until a nice golden crust forms. (The time will depend on the thickness of your salmon and your desired doneness). Remove the salmon filets to a plate and set aside. Lower the pan to medium heat and add the remaining tablespoon of oil to the pan. Sauté the garlic for 30 seconds and then add in the butternut squash noodles and cook until just softened. Transfer the noodles to a large bowl and set aside. Turn the heat back up to high and pour the chicken broth into the skillet, scraping any brown bits with a wooden spoon. Let the chicken broth cook down slightly and then add in the lemon zest and juice. Cook the sauce until it reduces by half, about 5-7 minutes. Turn the heat to low and stir in the ghee. This adds richness and emulsifies the sauce. Place the salmon into the pan with the sauce and add in the capers and half of the parsley. 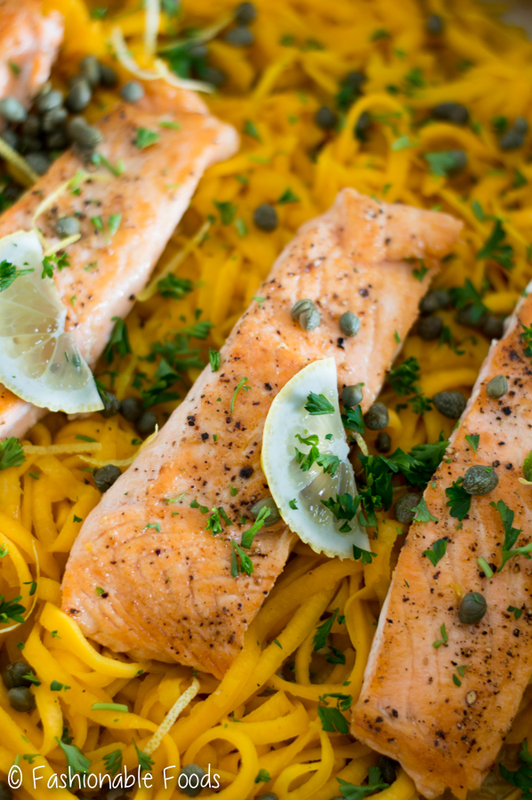 Serve the salmon piccata over the butternut squash fettuccine and top each portion with additional parsley. Not bad but the lemon is incredibly strong and the sauce is like watery thin. I prefer a thicker sauce. I did follow the recipe exactly. Hi Margie. I love a lemony sauce, but you can always reduce it if it’s too much for you. Perhaps your sauce didn’t reduce enough as it shouldn’t be watery thin. As it reduces it becomes thicker and absorbs into the butternut squash noodles. Hope this helps. I had the same results. I think it also tasted bitter, possibly from too much zest? The liquid would have to reduce to way less than half to be thicker.